Loki, big brother and best friend to Angus. Trouble maker and all around great dog. More personality than a dog deserves. More heart than you could imagine from a pet. But he wasn't a pet. He was a big brother and a sort of mentor to Angus. Anything Loki did, Angus followed, as a little brother should. From barking at strange cars to marking territory in a contest known as "The Piss-Off." 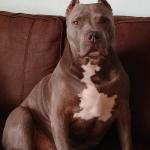 Loki was a beautiful, fawn, full blooded, loyal Pit Bull. As loyal as a dog can be. His sweet eyes and silly little grin would put a smile on anyone's face, no matter what. Though he wasn't the most beautiful dog, his Loki dust was just part of his charm. He was my best friend and truly the greatest dog I have ever had the pleasure of knowing. His daddy, who is missing him terribly, had the pleasure of knowing him, loving him and especially, of being loved by him for nearly 7 years. 7 short years. Loki will always be in that place in our heart that feels empty, feels lonely, feels that missing part of ourselves. Always listening for that second bark. Loki will be missed dearly by many. More than he would have realized. Loki was very important to all of us and we can't help but look at the rain today and feel like our loss is felt. Like it is not only us crying for the loss of our dear Loki. I am so sorry for you and all who mourn Loki. I can only imagine your sadness. If something ever happened to Sadie or Milenko, I would be beside myself. I feel so sorry for Angus, too, who won't understand why his friend is suddenly gone. I am so sorry for your loss of Loki. What a sweet and very precious description of him. 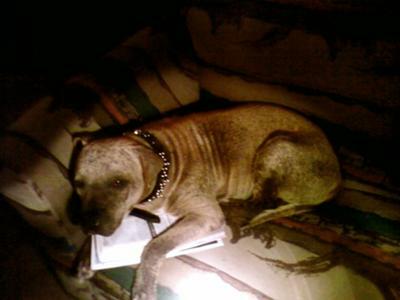 Like your family, we lost our girl Margo in December of 09 and it was pouring down rain. It was a sad day, and like your, for every rainy day, I think of her. Although I tear up every time I log on to DogQuotations.com and read memorials like yours, I make a point of doing so. It really helps in the grieving process. So sorry for your loss of Loki. Listen for his bark in the wind and he will visit in your dreams. Good luck. I lost my little buddy Ned 4 months ago and it still hurts. You can see him here at "My Little Buddy Ned."